Live Web Pages seamlessly integrated into your Presentation. Internet Explorer for ShowRoom is an add-on that enables you to easily insert a live web page into your PowerPoint presentation. Internet Explorer for ShowRoom comes with a set of features that let you precisely control how and when your live web pages is displayed in your presentation. It also offers a wide range of visual styling options to manage the way live web pages are running inside your presentation. The web page can be displayed into your slide, at the place you choose. 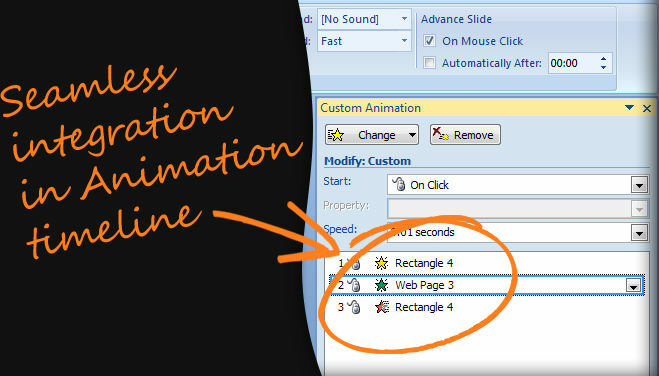 Click on it to play, or start it using a custom animation effect. 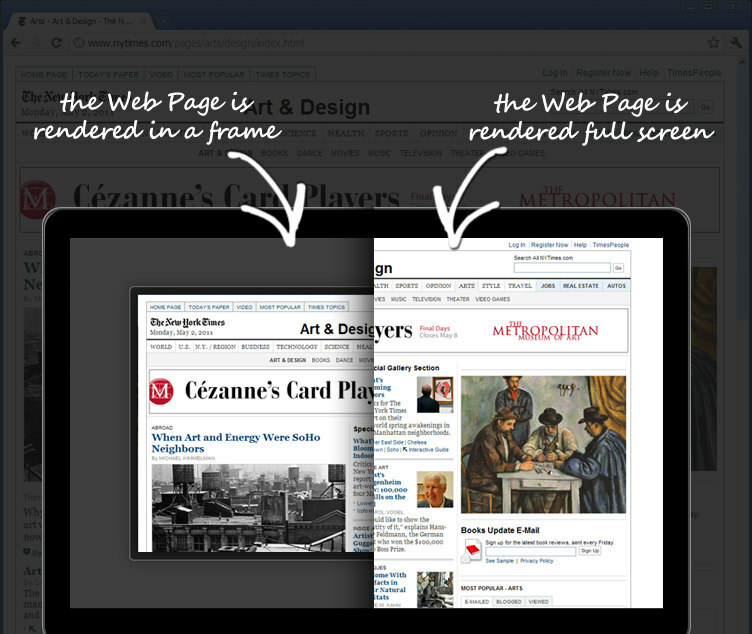 You can also run your web page in various full screen modes using built-in layouts. The Black Frame layout incorporates the web page in a transparent black overlay frame while keeping your slide visible in the background. The Entire Screen layout runs the web page in full screen mode. or a PowerPoint effect can start it. When the Web Page is first inserted, a poster Picture is automatically generated (the Poster picture is the picture displayed when the presentation is printed). It can be generated again later, from a scrolled view of the web page. You can also decide not to display the web page from the Internet during the slide show, and dispay only the Poster picture. ShowRoom can prevent the web page from stealing the focus during the slide show. This enables you to display any web page and be sure your keyboard will still control your slide show. Remote controls actions will not be disabled too.